A long time ago in a jungle in Aru Islands, Maluku, lived a group of deer. They were very proud of their ability in running very fast. They always stayed in different places. They challenged other animals in a running match. If the deer won the match, they took over the place and stayed there. Not far from the jungle, there was a beautiful beach. A group of sea snail lived there. The deer heard about the beautiful beach and planned to live there. They had a plan to challenge snails in a running match. What’s the rule?” asked the leader of the sea snails after he heard about the challenge. “Do you see all the capes there? There are twelve capes, from here until there,” the deer leader pointed the capes. The distance between one cape to another was very far. The sea snails then had a meeting. They set a strategy to win the match. “My plan is to put the twelve of us in every cape. If their runner arrives in every cape, you shout. So, the deer will never rest and gets very tired,” said the leader. And the day of the match finally arrived. 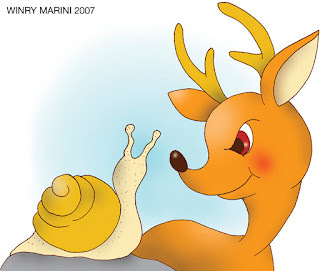 All animals watched this unique match, the deer versus the sea snail. The runners were standing side by side. Then, the deer ran very fast. In just a second, he already left the sea snail. After a few hours of running, he arrived at the first cape. “I’m here,” said the sea snail. He was another sea snail that was hiding in the first cape. The deer was surprised. He cancelled his plan to get some rest. He continued running. In every cape, there was always a sea snail. And the deer always cancelled his plan to get some rest. Finally, the deer almost reached the twelfth cape but he was exhausted. He was really tired. And he gave up. He did not have any more strength to run. He fell down on the ground. “Hooray!” said all the sea snails.